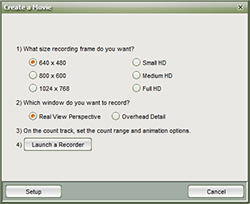 *For a step by step guide on recording your drill’s animation, click here. Movies of drills are a fantastic way to share your creation with clients, potential clients, and students (performers). Recording the drill animation is especially useful if your client does not have a copy of 3D to view the drill on their personal machine. To create a movie of your drill, you’ll need to go to the Utilities menu and choose Create Movie. A new window will open with various recording options. Set the size of the movie you would like to create, and then specify if you’ll be recording the Real View or the design grid. Once these are set, be sure to prep your playback options (play from beginning to end, a certain range, audio, etc.) and then launch the recorder. Two new windows should open, one from 3D with further instruction and the other for the screen recording. 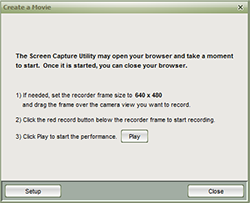 Once you have set up the recording and are ready to start, press the record button. You’ll have a small countdown before recording actually occurs so you may press Play.